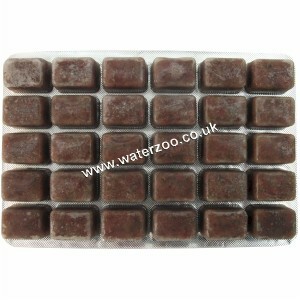 Frozen Mini Bloodworm is suitable for marine, tropical, coldwater, Cichlids and Discus. 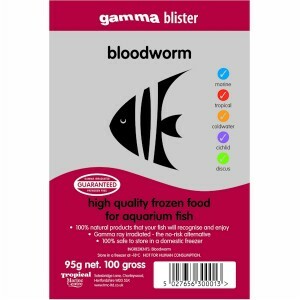 We use Gamma frozen Mini Bloodworm daily at The WaterZoo to feed all our tropical freshwater fish. All TMC Gamma foods are Gamma irradiated, this completely eliminates any risk of introducing harmful parasites or bacteria into your aquarium, and also means that the food is completely safe to store in your freezer. Blister packs are designed to dispense one measured cube of food at a time, this pack has 30, leaving the rest of the product sealed within their separate blisters. A quick and convenient way of feeding fish. Feed up to 4 time daily with a variety of Gamma frozen foods to suit the requirements of all your aquariums both small and large, carnivore and herbivore. Only remove from the freezer the amount of food that will be fed immedietly. Feed only as much as your fish will consume in a few minutes. To ensure water quality is not affected any food which remains uneaten after 10 minutes should be removed from the aquarium, and subsequent feeding quantities reduced. Frozen mini Bloodworm is currently only available for collection and payment in store.